He was 39 years old but moved like an old man, his body weakened by HIV, his right side withered by stroke. At a crowded clinic in Entebbe, Uganda, he confessed that he could not stop crying, and a voice in his head kept telling him to end it. He had already bought a rope. His HIV diagnosis would have once been a swift and sure death sentence here. But stunning advances in antiretroviral drugs have helped transform the disease into something in many ways more complicated: a chronic condition—a life sentence. A small team of RAND researchers has spent years working with local clinics in Uganda to help people not just survive HIV, but learn to live with it, and even thrive. Their work has helped treatment-weary patients keep up with their medicine, delivered care to itinerant fishermen, and let one desperate man, aged beyond his years, see the way to another day. It might not seem that an American trucker has much in common with a fisherman on the rough waters of Lake Victoria. Or that lessons learned in the busy HIV clinics of Kampala could improve diabetic care in the United States. But there are common threads here, and they run through the research RAND has been doing in Uganda for more than a decade: the difficulty of getting treatment to people on the move; the social and psychological costs of chronic disease; the day-in, day-out drudgework of keeping up with a drug regimen. The reality of life in Uganda puts those challenges into stark relief. The country is about the size of Oregon, with a population approaching that of California—and, with 1.5 million cases, more people living with HIV than in the entire United States. “Everybody is touched by the epidemic. Everybody has a family member that is touched by the infection. Everyone is impacted,” said Glenn Wagner, a senior behavioral scientist who leads RAND's work in Uganda. 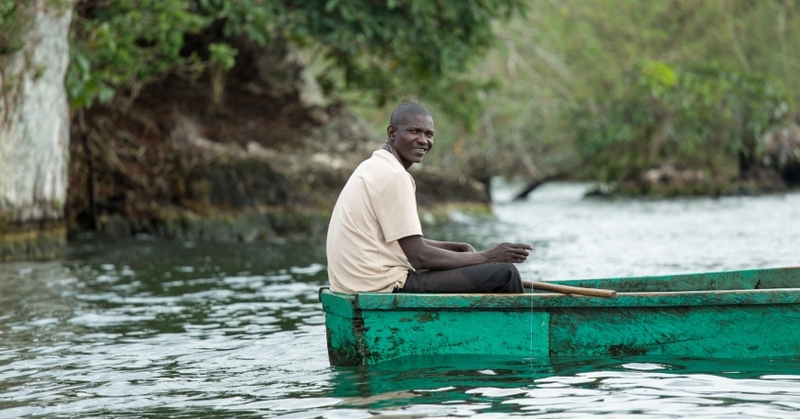 That's what led senior behavioral scientist Laura Bogart to the fishing islands of Lake Victoria. She had asked clinic staffers in this rural part of Uganda where they needed help the most. In response, they took her to a remote village—to a tent where fishermen were being tested for HIV. They were desperately poor—men whose very lives depended on chasing migrating schools of fish across the African Great Lake. Bogart watched them emerge from the tent staring at pieces of paper that said they were HIV-positive, with the name of a clinic some 30 miles away for treatment. She could see from their faces that those 30 miles might as well be 300. They would never make it. Bogart and the community clinicians started making trips to the islands themselves, sometimes making the rough crossing as water swirled around their feet in the bottoms of the boats. The clinicians tested hundreds of fishermen and their families in those few months, at times going door to door, and then delivered drugs to the more than one in ten they found infected with HIV. It was not as easy as setting up a tent. But it demonstrated that meeting people where they are—not just with tests, but with treatment—could save lives in such hard-to-reach, on-the-move communities. Sebastian Linnemayr knew the people he saw at the HIV clinics had been up since before dawn, waiting in line for hours for a few minutes with a doctor. They were on drug regimens that demanded near-perfect adherence, no excuses. They could live with the disease they carried if they kept up—but their lives would never be the same. Linnemayr is a senior economist at RAND whose work in Uganda had focused on labor markets and loan programs. He wondered whether basic economics could give those people standing in line a little reward—a nudge—to help them keep their appointments and stick to their drug regimens. Could giving people with HIV a little reward—a nudge—help them keep appointments and stick to drug regimens? He put numbered cards in a bag and announced a lottery, open to anyone who kept up with the treatment. The prizes were little more than tokens: an umbrella, a thermos, a $2.50 mug. It wasn't buying adherence—it was playing on a simple principle of behavioral economics, turning a chore into a challenge, a grind into a game. And it worked. The number of patients with near-perfect adherence jumped by 20 percentage points. Just as astonishing: People left the clinic laughing. That's a message Wagner has tried to live for more than a decade. He was part of RAND's earliest work in Uganda, a 2006 study on expanding access to life-saving drugs. He's returned at least a few times almost every year since then, building a tight partnership with clinic leaders and local researchers that has helped shape and strengthen RAND's research there. He also helped found a nonprofit shelter in the capital city of Kampala—Covenant Youth Home—that now houses, educates, and counsels 15 former street boys. His recent research has focused on improving not just the physical health of people living with HIV, but their mental health as well. It's driven by what he saw at clinics across Uganda, where people would describe crushing sadness, sleepless nights, trouble concentrating—what one woman described as bad feelings. Depression and other mental health problems are common in people with HIV. But the clinics often had only a few nurses, a medical officer—and patient lists hundreds of names long. Few had the time, much less the experience, to screen patients for depression and get them the help they needed. Wagner teamed up with local researchers to develop a simple checklist protocol that nurses and other clinic staffers could use to quickly assess patients for depression. In hundreds of cases, it has proven just as effective at getting depressed patients into treatment as evaluations by trained doctors. “It just brings hope to people,” Wagner said. He didn't have to wait long to see the impact. One of the first patients the clinics screened with the new protocol was that 39-year-old man, half-paralyzed by stroke. He told his story as a nurse worked through the questions: He was HIV-positive. His wife had left him. He couldn't work. He had lost sleep, lost his appetite, lost the energy to keep up with his daily routine. The nurse diagnosed him with severe depression and assured him he could get treatment. “You mean 'it' has a name?” he asked. And then he smiled. He asked if someone would accompany him home. He had a rope, he explained, but he didn't think he'd need it, and he wanted someone to take it off his hands. RAND's work in Uganda benefits from strong partnerships with Mildmay Uganda, an organization that operates HIV clinics there, and with researchers at Makerere University in the capital city of Kampala.